Horkey Handbook Reviews - Legit or Scam? Horkey Handbook Reviews – Legit or Scam? This website was created by Gina Horkey, a woman who says she decided to create her own freelance career in 2014 and within six months was earning more than $4,000 per month while just working part-time. Currently they offer people two different full length courses intended to help people Become a Writer, priced between $59 and $199, or to Become a Virtual Assistant, priced between $75 and $300. However, the Horkey Handbook understands that people might not be completely ready to commit to a paid training program if they aren’t sure that a freelance career is the right fit for them and their lives. So to help people decide whether or not one of their paid programs is the right fit for their needs, they offer three different free classes: Kickstart: Your Freelance Writing Biz, Jumpstart: Your Virtual Assistance Career, and 7 Days or Less: To Branded Website Success. 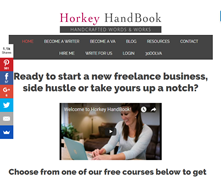 Though Gina Horkey describes having fantastic and fast results from her decision to become a freelance business owner, these are not necessarily the standard or even common results from freelance work. This is not to say that you can’t or won’t be able to earn money from a freelance career, but just to make sure that people understand that this is a serious and difficult undertaking. This Refund Policy is essentially a non-policy. It’s there to make people feel more comfortable about investing in their program but there are so many limitations and requirements that it would be nearly impossible for anyone to be able to successfully collect their refund. Because of this, customers who invest in this program should proceed as though there isn’t any Refund Policy at all. Average Rating for " Horkey Handbook Reviews " is 0 out of 5 based on 0 reviews.